Bexley Voice has co-hosted with Bexley SNAP, Bexley Mencap and Bexley NAS, 2 free seminars on PIP and Disability Benefits. The seminars were a great success with over 50 attendees at each event. Both speakers came from DWP (Department of Works & Pensions) and gave excellent and up to date information. Thanks to everyone who made these free seminars happen. 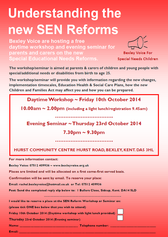 Bexley Voice hosted a free daytime workshop and evening seminar for parents and carers in Bexley on ‘Understanding the New Special Educational Needs Reforms’. The workshop/seminar was aimed at parents & carers of children and young people with special/additional needs or disabilities from birth to age 25. It provided information regarding the new changes, implementation timescales, EHC (Education, Health and Social Care) Plans, the local Offer, how the new Children and Families Act may affect you and how you can be prepared. Thank you to everyone who worked hard and volunteered their time to make this free event happen. If you were unable to attend, please follow this link for more information. 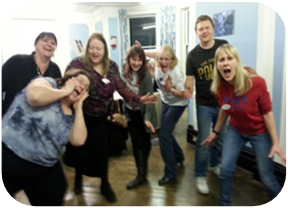 Bexley Voice Annual General Meeting took place on the 11th of September in Sidcup. The meeting was an opportunity for Bexley Voice to share what we have been doing over the last year, celebrate our achievements and outline our plans for the coming 12 months. The formal business of voting in the new Management Committee was completed and we all enjoyed refreshments afterwards. For the information required to become a trustee (and also a volunteer) please refer to our main menu. Bexley Voice enjoyed the sunshine at Lark in the Park on Friday 1st August. This was a free event running many different fun sessions for children and adults over 2 weeks every August. Volunteers Claire and Rachel spoke to parents and carers and signed up several new members. They gave out information on local support groups such as Bexley Snap and Bexley NAS. Thank you to Bruce at Asda in Bexleyheath for donating prizes for Bexley Voice's raffle/tombola. We raised an amazing £50.00 and all children and adults who purchased a ticket went away very happy, even coming back for many more turns. BV was asked to be Match Sponsors for VCD Football Club in Crayford, on Tuesday 29th July, for a friendly game between VCD and Dartford. BV volunteers Mary, her boys and Lil, plus Claire, Gary and the twins enjoyed the football; starting at 7.45pm in brilliant sunshine and ending 9.30pm with floodlights. VCD beat Dartford 3:1. BV had the honour of choosing ‘Man of the match.’ We chose the VCD Goal Keeper, who saved countless shots at goal and deflected a brilliant penalty (had it gone in.) We appreciated tea and cake at halftime and were given V.I.P treatment. Thank you VCD for a memorable evening and your hospitality. The National Play Day event took place at the Danson Youth Centre on the 6th of August and included entertainment and activities for over 1000 children of all ages - trampolines, donkey rides and an Astro Dome to name but a few, providing wonderful fun for all. Bexley Voice volunteers Claire and Rachel, welcomed 8 new members, gave out information on the new EHC plans and raised £25 with our raffle, many thanks to Bruce at Asda for donating the prizes. Thanks to our new volunteers, Kerrie, Zoe and Shannon for your help on the day. Congratulations to Joy Toghill and her team for a superb event. Please refer to the drop down sub menu for more information on what Bexley Voice got up to in 2012/3. Some, (but certainly not all as we are a very busy team!) of the meetings and events we attend are listed below for 2014. Saturday 29th - Sponsored Fun Run, Sidcup Christchurch. Wednesday 9th - School Visit - Crook Log Primary, Bexleyheath. Sunday 27th - Information Table - Summer Fair to raise funds for Bexley Snap and Bexley NAS. Wednesday 1st - School Visit - Fosters Primary, Welling. Wednesday 8th - School Visit - Barrington Primary, Welling. Wednesday 26th - School Visit - Crook Log Primary, Bexleyheath. 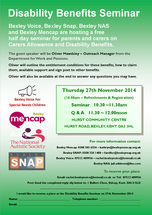 Thursday 27th - Disability Seminar - Hurst Community Centre.